This documentary was filmed and edited by CrossWater Productions and led by Dr. Wesley Uenten, Dr. Keiko Yamanaka. I narrated and assisted in the production as well as did others who added their critical input and direction such as Dr. Ben Kobashigawa. See my earlier post on this piece. The Loving vs Virginia Case in 1967 repealed these laws across all states (mostly in the southern states) but for those couple coming from places like Okinawa before then, it meant finding a place to live comfortably as an interracial couple. 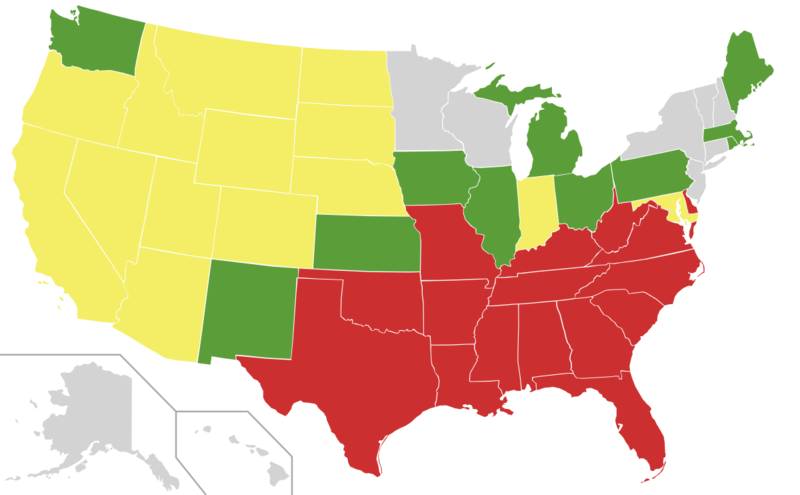 GREY=No laws passed; GREEN= Repealed before 1887; YELLOW= Repealed from 1948 to 1967; RED=Overturned on 12 June 1967 “US miscegenation” by Certes – Vector map from Blank US Map.svg Information from Anti-miscegenation_laws. Licensed under CC BY 3.0 via Wikimedia Commons. I grew up hearing snippets of the “coming to America” stories from my mother’s friends. For many of these women, the exact details of these racist laws were not clear but they could make out the fear that they generated. My mother told me she only began to assemble what those laws meant from anecdotes told by other Okinawan women she would meet through the military community. To some degree, my mother was shielded from seeing these attitudes of anti-mixing because we lived in a mostly all-black community (and there was a different kind of acceptance of Asian women–more on this in a future post) and also because my dad never really took her out of this community much during that intense period. Her friends however, described the shame they felt when their in-laws would give them a cold shoulder or refused to do anything with a “Jap” and difficulties they faced in certain social situations. For example, I remember the well circulated tale of an Okinawan woman being separated from her Black spouse at a movie theater in Louisiana because she was in violation of the order of things. The laws were already illogical but the triangulation of races in places more accustomed to dealing with the Black/White binary made for even more confusion for some of these immigrant women. Every June, I see a flurry of posts on Loving Day on various social media outlets. “Happy Loving Day!” I’ve never been one to partake in these kinds of general celebrations because they seem too glossy—that is, the overt celebration and sometimes over-romanticization of mixing uncomfortably borders dreaded post-racial discourses. “Come to a Loving Day picnic! !” a flyer will announce excitedly. I never have and most likely never will unless there is an accompanying critical lecture/discussion planned with some Texas style BBQ. But my thoughts on this are beginning to shift as I understand how radical these meetings and celebrations can really be for some people. The articles on Loving v Virginia case are incredibly interesting as are those of other couples and their litigators/supporters who tried cases in other states. And I celebrate them privately. Their stories about their efforts to simply be in public with the one they loved or live together under the same roof without the fear of harassment are astonishing. That they were brave enough to eventually test the court’s rigidity and ridiculous logic steeped in white supremacy is indeed something to memorialize. I realize that for some couples, this landmark case is much deeper than the commercial-like, neoliberal aspects I initially saw in some Loving day promotions. I now realize why it was a brilliant move to make this a commemorative day of celebration (see FAQ’s here). My grandmother on my father’s side is biracial. Her father was White and her mom Black. Her parents were somehow married when it was still illegal in Texas — I’m not sure by whom and where (I still need to recover this story from all my extended family) and they lived together until they died. That was an incredible feat in those days. 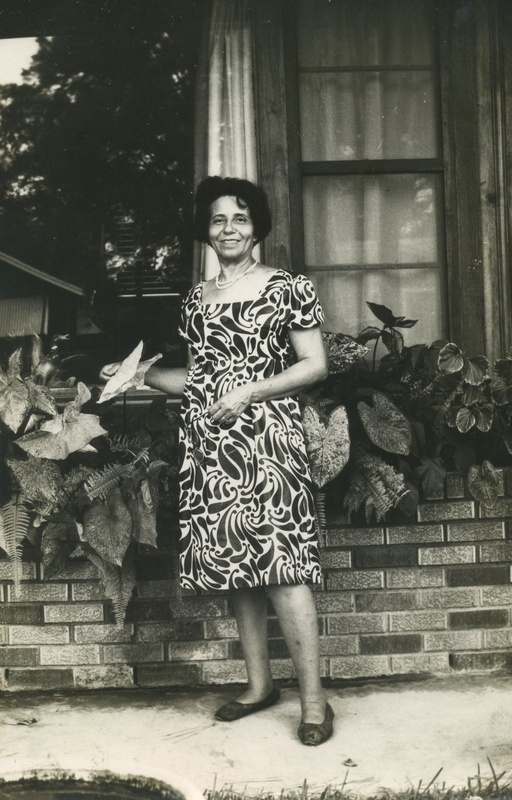 My grandmother must have seen her parents endure some terrible, and I’m sure violent times as an interracial couple decades before their marriage would have been considered legal and I think partially because of that, she extended nothing but kindness to my mother when she arrived in Texas. Where did the military send mixed couples then after leaving Okinawa? I was told that there were certain bases where they would send interracial couples because it would be more accepted there. My parents were viewed as an interracial couple because my dad could pass as Caucasian even though he was mixed and was raised as an African American. Bases in Washington state, and others on the west coast were places with really mixed families. The cultural landscape of bases and the base borderlands on the west coast, according to this woman, were much more diverse and accepting of interracial couples than on and around bases in the South. She staunchly believes it is why the number of Okinawan (as well as Korean, and Filipino) spouses were much more prominent in these places before the Loving v Virginia case made headway in those last fifteen states that had not yet repealed those particular racist laws. This is not my direct academic research topic but at some point I’d like to research the stats around this issue for my mother’s biography. I do know that many of my mother’s friends eventually made their way back to their husband’s hometowns in the south just after the repeal and found life to be quite difficult. Also, I would love to find “the list” of places some of my interviewees keep referring to when we discuss their time around PCSing back to the US from Okinawa. I’ve been told by a few couples now that they were given a sheet of paper explaining which states they couldn’t return to as an interracial couple. I am curious about the language used to discuss it (if at all). Any readers have a copy they can send me via email? Go to my contact me page above if so. It’ll make my day.